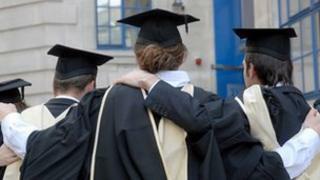 Maintenance loans and grants for students in England will rise by 1%, in 2014-15 - less than the rate of inflation, the government has said. The increase was announced in a written statement by the universities minister David Willetts. The maximum grant will be £3,387, for students who started their courses after September 2012, said Mr Willetts. The maximum loan will be £7,751 for a student living away from home and studying in London, he added. For students outside London and renting accommodation the maximum loan will be £5,555. The most students living at home will be able to borrow will rise to £4,418. Liam Burns, president of the National Union of Students (NUS) said the below-inflation rise amounted to a "real-term cut in support" and called for fundamental changes to the way student finance was administered. "The gap between the cost of living and the amount of support available to students continues to widen and not increasing support at least by inflation is not acceptable. "If the government truly values education they must make sure that students receive adequate levels of financial support", said Mr Burns. He added that NUS research had shown that many students were struggling to make ends meet, concentrate on their studies and "stay the course". The government also says that tuition fees, which controversially rose to up to £9,000 a year from September 2012, will not increase further in 2014-15, for either new or continuing students. Loans to cover tuition fees would also be pegged for full and part-time students, said the government. However maximum fee grants and course grants for part-time courses that started before September 2012 will be increased by 1% in 2014-15, according to the statement. Universities are concerned that the income from tuition fees will not cover the loss of government funding that they replaced. Nicola Dandridge of Universities UK said: "Not up-rating the fee for the second year in a row will inevitably have the impact of eroding income for investment in the future, at a time of rising cost pressures, increasing student expectation, and the need to compete effectively in the global economy." The announcement that tuition fees were to almost treble from September 2012 provoked angry protests from students at the end of 2010. The package of measures was passed in the House of Commons despite the first major backbench rebellion faced by the coalition government.